The International Society for Transgenic Technologies (ISTT) is participating as exhibitor at the current FELASA-SECAL Congress, being held in Barcelona (Spain), on June 10-13, 2013. 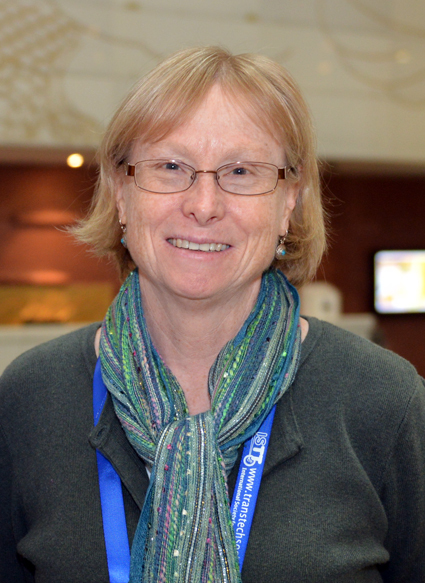 Alison Cameron, the ISTT administrative assistant, will be responsible for the ISTT booth. If you are attending this international conference on Laboratory Animal Science, please come to visit us. We’ll be deligthed to welcome all of you at the ISTT booth (#230), at the FELASA-SECAL 2013 venue, in the beautiful town of Barcelona. Looking forward to meeting you there! Farewell from council: See you soon Jan and many thanks! Today, on June 1st, 2013, Jan Parker-Thornburg, Ph.D., Associate Professor at the Department of Biochemistry and Molecular Biology, The University of Texas MD Anderson Cancer Center, Houston, TX, USA, and Manager of the Genetically Engineered Mouse Facility (GEMF), has stepped down from the ISTT council, voluntarily, after having been part of the ISTT Executive Committee since the inception of this Society, in 2006, being elected in 2006 and re-elected in 2010. With her most generous gesture, Jan allowed a new council member to be elected in 2013, and gave herself the required distance from council, in order to prepare herself to run for the elections of the next President of the ISTT during 2014, as she recently declared, hoping to deserve and receive the support from ISTT members and be elected among any additional candidate. The activities and initiatives where Jan has participated or led while serving as member of the ISTT council are numerous. Just to name a few: the great meeting she organized in Houston in January 2008; her leadership and ISTT driving force to become an AALAS affiliate organization in May 2009; her generous effort preparing embryo handling tubing/kits that were distributed among ISTT members in Berlin, at the TT2010 meeting; her leadership in the nominations committee, through which all of the new members have been eventually elected to serve at the ISTT council, not to mention her continuous and most dedicated participation in all council discussions. Dear Jan, on behalf of the entire ISTT family, you truly deserve our gratitude, respect and a big applause. Let’s hope that this farewell is only transient and soon you will come back to lead and further boost our Society! See you soon and many thanks! Author LluisPosted on June 1, 2013 Categories council members, elections, ISTT Members, membershipTags Council Election, Council Member, ISTTLeave a comment on Farewell from council: See you soon Jan and many thanks!